Diane Wilson, author of Beloved Child: A Dakota Way of Life, shares how and why she came to write about overcoming the unrelenting trauma resulting from the colonization and assimilation of the Dakota community. Her book profiles several contemporary Dakota people who are sustained by rich traditions, ceremonies, advocacy, and education and are transforming the legacy of colonization into a better way of life for their children. Videos of Clifford Canku and Gabrielle Tateyuskanskan, two of the people featured in Beloved Child, are also available online. Video footage is from the book launch hosted by Birchbark Books and held at St. Paul Episcopal Church in Minneapolis. Dr. Janet D. Spector, professor emerita and former assistant provost at the University of Minnesota, and groundbreaking scholar of gender studies and American archaeology, died September 13 at her home in Albuquerque, New Mexico, after a long struggle with a recurrence of breast cancer. She was 66. “Janet Spector began her 25-year career at the University of Minnesota in 1973, a tumultuous time in academia. History, sociology and other disciplines were cracking open their doors to women’s long-left-out perspectives, and female scholars were standing up for their work against considerable pushback. “With a fine blend of energetic curiosity, intellectual firepower and personal charm, Spector not only contributed significantly to the field of American archaeology, but also helped pave the way for other female scholars, according to colleagues and friends.” (Excerpted from the Star Tribune obituary, accessed online October 2, 2011, “Prof. Janet Spector, pioneering scholar at U,” by Pamela Miller, http://www.startribune.com/obituaries/130915723.html). “I last heard the voice of Professor Janet Spector at a session of the 2008 Berkshire Conference for Women in the Twin Cities. She spoke about the awl featured on the cover of her 1993 book, What this Awl Means: Feminist Archaeology at a Wahpeton Dakota Village (Minnesota Historical Society Press). Spector described the object as evocative. It is a handsome object, but what made it evocative for her was that it was a common tool that was both decorated and well used. To anyone who works with material culture those two qualities tell us why objects have so much meaning for humans–and why individuals save and museums preserve them. (Marcia G. Anderson is an independent curator and is writing a book on Ojibwe bandolier bags.) For further perspecitve on Dr. Spector’s work and life, please see the obituary by Barbara Noble, published by the University of Minnesota’s College of Liberal Arts, here. Navy nurse veterans Kay Bauer (a St. Kate’s alumna) and Mary O’Brien Tyrrell, two of the women profiled in the book, will speak and be in attendance. Wednesday, September 28, 2011, from 7 to 8:30 p.m.
Free and open to the public; books will be available for sale at the event. Fifteen Minnesota nurses spent a year caring for the casualties of a divisive war, only to come home and descend into isolated silence. To heal themselves, they banded together as veterans. Bauer was one of approximately six thousand military nurses who served in Vietnam. Historian Kim Heikkila, author of Sisterhood of War: Minnesota Women in Vietnam, delves into the experiences of fifteen nurse veterans from Minnesota, exploring what drove them to enlist, what happened to them in-country, and how the war changed their lives. Like Bauer, these women saw themselves as nurses first and foremost: their job was to heal rather than to kill. After the war, however, the very professional selflessness that had made them such committed military nurses also made it more difficult for them to address their own needs as veterans. Reaching out to each other, they began healing from the wounds of war, and they turned their energies to a new purpose: this group of Minnesotans launched the campaign to build the Vietnam Women’s Memorial. 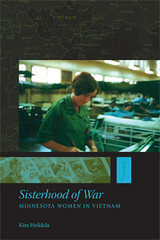 In the process, a collection of individuals became a tight-knit group of veterans who share the bonds of a sisterhood forged in war. Kim Heikkila is an adjunct instructor in the history department at St. Catherine University, where she teaches courses on U.S. history, U.S. women’s history, the Vietnam War, and the 1960s. Read more about Kim in Minnesota magazine. If you miss the event at St. Catherine University, join Kim and and Kay Bauer and Mary Beth Crowley at the Minnesota History Center’s History Lounge on Tuesday, October 25, at 7 p.m. Many of the interviews in the book are part of the Minnesota Historical Society’s Oral History Collections. Have fun exploring the tastes, sights, and smells at the Minnesota State Fair with the Fabulous Fair Alphabet game inspired by the book by Debra Frasier. On Thursday, September 1, meet David LaRochelle, the Minnesota home-grown author for the day featured in Baldwin Park as part of the Fabulous Fair Alphabet festivities, sponsored by the Children’s Literature Network. 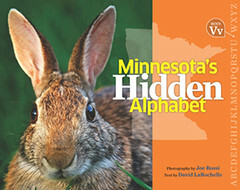 David is the author of several children’s books, including Minnesota’s Hidden Alphabet with photos by Joe Rossi. Books will be available for purchase in Baldwin Park (across from the 4-H building) as well. The breads of master baker Klecko have been served in some of the finest restaurants in Minneapolis and St. Paul. With decades of international culinary experience, Klecko has baked for presidents, rock stars, and professional athletes. But perhaps his most appreciative clients are dogs: he shares his favorite recipes in our book K-9 Nation: Baking for Your Best Friend. And finally, on Sunday, September 4, celebrate Minnesota History Day in Carousel Park, sponsored by the Minnesota State Fair Foundation and the Minnesota Historical Society. We will feature entertainment, contests, crafts, and more. The prototype (or beta version) of MNopedia, an online encyclopedia about Minnesota, is now live for public review. Initial entries highlight people, places, events, and things from the Industrial Era of Minnesota history (1865-1914). The entries also point to related resources in the Minnesota Historical Society collections, including historic images and Minnesota History articles. From this beginning, the encyclopedia will grow to include a wider range of content from additional contributors. Minnesota Historical Society Press authors and other respected experts have already signed on to contribute. Visit the MNopedia prototype to learn more and offer feedback. Comment on an existing entry or suggest a new one. Join the web site’s discussion forum. User feedback will help the Minnesota Historical Society refine and expand the encyclopedia in the coming year. The Minnesota Historical Society Press is developing MNopedia in partnership with other programs and departments at the Society, with support from the state’s Arts and Cultural Heritage Fund. Sunday’s Yahoo News column, Who Knew, celebrated the 332nd anniversary of the first European journey into the Great Lakes. Lucky for us, we have one of those great natural landmarks in our backyard, the mighty Lake Superior. Among the wonderful details featured in the video, here are some more fun facts about our very own great lake. Lake Superior, by surface area, is the world’s largest freshwater lake. With an average underwater visibility of 27 feet, Lake Superior is the cleanest lake out of the chain of Great Lakes. There have been more than 350 recorded shipwrecks, most of them happening during “Northeasters,” when high winds and rainy low pressure systems fly over the lake, creating dangerous conditions. More than 60 fish species call Lake Superior home. For more on the majestic Lake Superior, check out Shining Big Sea Water: The Story of Lake Superior by Norman K. Risjord. A compelling history of the lake’s glacial origins all the way through its present-day uses, this book also offers helpful travel tips and new tidbits about this great lake. P.S. 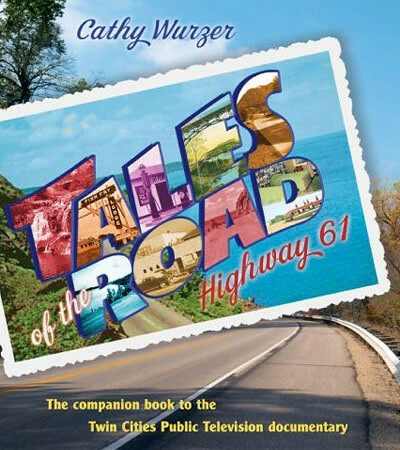 Don’t forget to enter for a chance to win a copy of Cathy Wurzer’s Tales of the Road: Highway 61. Share your favorite highway 61 travel destinations by leaving a comment, and who knows: you might just get to have your very own copy courtesy of MHS Press and Borealis Books! Tales of the Road is on the move! Minnesota Public Radio Morning Edition host Cathy Wurzer, author of Tales of the Road: Highway 61, has worked hard to keep up to date with the digital age. From blog posts to Twitter feeds, she’s got all the bases covered. But nothing excites her more then the recent launch of her new website, the improved and inviting Tales of the Road. In honor of the new website, we would like to hear from you. What is your favorite place to visit along Highway 61? Is it the North Shore’s Split Rock Lighthouse? Could it be the Aerial Lift Bridge in the picturesque city of Duluth? Or maybe the Apple Capitol of Minnesota, located in the quaint town of La Crescent, is more your style. Whatever it may be, leave a comment telling us your favorite attraction located on Highway 61 and you will be entered to win your very own copy of Cathy Wurzer’s Tales of the Road: Highway 61. Entries will be accepted from today until Monday, August 15, with the winner announced on next Tuesday’s blog post. Good luck, and happy commenting! Hold on to your Skivvies: It’s National Underwear Day!! In 2003, Freshpair created the ideal forum for celebrating intimate apparel when they rolled out the innovative holiday, National Underwear Day. The original event set the tone for all the future events. National Underwear Day models acted as Underwear Ambassadors and took to the streets in New York. They strolled the runway and the sidewalks alike, clad just in bras, briefs, trunks, bikinis, boxers, and lingerie. They collected signatures from the public to support the National Underwear Day movement and create a national holiday. So maybe you aren’t adventurous enough to jog around the city in your briefs. Lucky for you, we have a few suggestions. The Minnesota Historical Society has a wonderful exhibit that discusses undergarments with a Minnesota twist. Underwear: A Brief History is a display of undergarments of the past and the company records of Munsingwear, Inc., founded here and putting Minnesota on the map in the world of underwear. The exhibit is available for viewing from now through September 11, so be sure to visit before it’s too late! If a museum stop won’t fit your schedule, never fear: the Minnesota Historical Society Press has got you covered. In the Mood for Munsingwear: Minnesota’s Claim to Underwear Fame by Susan Marks is a book written in conjunction with Underwear: A Brief History. In the Mood for Munsingwear tells about the Munsingwear craze that took over the nation and also describes the progressive relationship the company had with its employees compared to other businesses of the era. Not only is today a day for celebration, it’s also a day for raising awareness. Freshpair has partnered with the National Prostate Cancer Coalition to spread awareness of this terrible disease. Click the link for more information on how to get involved and to hear more about the mission and purpose of the National Prostate Cancer Coalition. Envision Minnesota partnered with Twin Cities Public Television to co-produce a series of one-minute Legacy Letters videos featuring individuals who talk about what they treasure most in Minnesota. The videos began airing on the Minnesota Channel in 2009. A new set of Legacy Letters funded by a Minnesota Historical and Cultural Grant was created in spring 2011 and the spots began to air this past week. MHS Press author Dave Kenney shares his passion for Minnesota’s old movie theaters in his Legacy Letter. 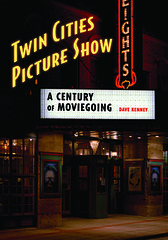 For more on the fascinating cinematic history of the Twin Cities, check out his book, Twin Cities Picture Show: A Century of Moviegoing. More bite-sized portions of Minnesota history can be found online at MN90: Minnesota History in 90 seconds, the radio series produced by the AMPERS radio network and the Minnesota Historical Society. The Minnesota Historical Society and all of its museums, sites and programs are closed because funding from the State of Minnesota, which comprises more than half of the Society operating budget, has not yet been approved for the fiscal year beginning July 1. This includes the Minnesota Historical Society Press. However, if you would like to place an order for MHS Press books, you may still do so through the Chicago Distribution Center at 800-621-2736. Our e-books will also continue to be available from popular e-book vendors. The Minnesota Historical Society website, www.mnhs.org, will announce our reopening date as soon as it becomes available.